Personalized license plates have moved firmly into the mainstream. The most recent data that I could quickly scour off Wikipedia shows that at America’s peak point for vanity (between 2006 and 2007 at the height of the Bush Years), we had nearly 10 million personalized plates in this country. It’s easy to understand why. 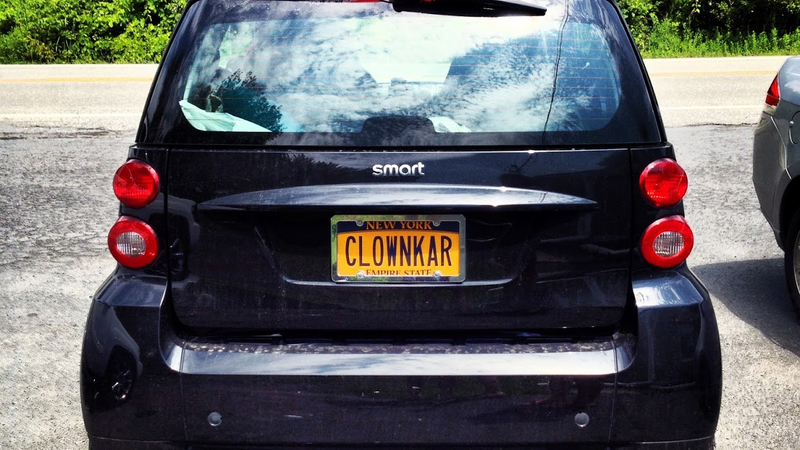 They’re easy to think up while you’re stuck in traffic and they’re an affordable thing to splurge on (Here in New York, a personalized plate only costs an extra $60 up front and $31.25 annually beyond that.) Also, people are complete morons. Reason One: We get it, you’re clever. We get it, Tesla guy. Your car is electric. You do not need to put LOLGAS in all caps on the back of your car for everybody else to read on the 405. And we get it, Honda bro. Your car is low. You do not need to put LOLSLOW on your plates for us to read while you dodge potholes. There has never, in the history of all time, been a personalized license plate that had the genuine sparkle of humor beyond a light chuckle. Usually what you get are painful in-jokes. I don’t know how many Nissan GT-Rs there are across the country that say GDZLLA on the back but I can assure you it is too many. Reason Two: How much did you spend to tell me how clever you are? Even if you have successfully found an in-joke or a piece of trivia that your car communicates to the rest of the world, going all the way to put it on your license plate is too much. Oh-ho! your plate reads. I am familiar with the racing history of the Nissan Skyline GT-R during its touring car campaigns in Australia during the 1990s when it was given this nickname! I will put it on the back of my car so that you can see it, and recognize it! Then you will recognize that I also know this piece of trivia! You will see me and know that I am clever! I am clever! I am! You do not need to shout out to the rest of the world that you’re keyed in on some piece of nerdcore arcana. Even the very absolute most obscure and most clever and most in-jokey in-joke (it’s this one) gets real bad when you realize somebody paid the DMV to let them shout to the rest of the world, emblazoned in all caps on their license plate, that they get it. There’s also an interesting obsession that has popped up with license plates in the United Arab Emirates. Rich people over there realized they could look extra cool if they had very low numbers for their plates, and the state realized they could make a ton of money by auctioning off the very lowest ones. The high demand/limited supply nature of this affair, coupled with how completely weird rich people get once they get stratospherically wealthy, is what led to one person spending some $4.9 million to get the license plate ‘1’ last year. If there was ever a signifier for the emptiness and madness of lots of money, it was this. The whole fun part about a license plate is that it’s a random collection of letters and numbers. You have to memorize it, and that’s a pain, so you have to ascribe some meaning or rhythm to it. GFG 3224 is not a set of letters or numbers that I would normally keep in my brain, but it was my old car’s plate, so it makes me happy every time I think of it. Even if I see a GFG anywhere or a 3224, I think of my old VW. License plates are inherently meaningless. We bring meaning to them. That’s a bond, one that you miss out on with every CHVYSKS you put on your F-150.